What do you do when you need to provide Internet connectivity for one of the largest live music and film festivals in the world? You build out a wireless backhaul network using point to point microwave! At the 2011 SXSW (South by Southwest) Film and Music Festival tens of thousands of people from around the world swarmed to Austin, TX to experience the latest in film and see the over 2000 bands that played live at over 200 venues. The SXSW event merges film, music and technology all in one place. Technology is playing an even larger role at SXSW. It was the place that Microsoft launched their new IE9 platform. Austin was filled with members of the media reporting on the events and who's making news in the film and music industry. Bloggers are found on every corner writing about who's playing and getting signed to large record labels. Live concerts were broadcasted live over the Internet. Bands like the Foo Fighters, Duran Duran, Blue October, Kid Rock, Snoop Dogg, Bob Schneider, Crystal Bowersox, and many others showed up without much warning to perform. In years past, one of the biggest complaints was the lack of broadband connectivity, that's if you could get connected at all. With so many people in such a concentrated area many of the cellular networks get overloaded and come to a crawl. Add to the fact that there is now a 1 to 1 or even a 2 to 1 ratio of wi-fi enabled devices to people. Laptops, iPhones, iPads, and all the other smartphone devices were present everywhere. This year SXSW wanted to make sure that they could enhance the attendees experience by bringing wireless bandwidth to the people. SXSW could get a large (GigE) Internet pipe to their corporate office but couldn't get connectivity to the major facilities by the local telecommunication providers. With months of planning At&t, Time Warner, Verizon, etc. failed provide a temporary wireless solution. So they turned to Alpha Omega Wireless to solve the problem. We were able to build out a high bandwidth, point to point wireless backhaul network from their facility to some major venues around Austin. Even though the fiber providers couldn't do it with months of advanced notice the wireless installation of SXSW's wireless broadband was deployed in days. Because of the bandwidth demand we used full duplex microwave radios, such as SAF Lumina licensed microwave and 24GHz unlicensed wireless ethernet bridges, BridgeWave 60GHz wireless links, and a few unlicensed wireless bridges for specific events. Most venues were able to get 100Mbps full duplex wireless connectivity. 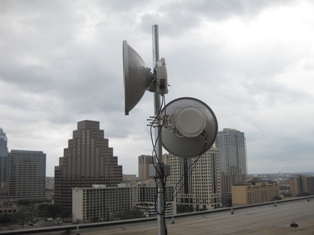 Wireless backhaul used for the core network distribution and last mile wireless used to provide bandwidth to special event venues gave SXSW a lot of flexibility and the ability to provide wi-fi to attendees. Once the event was over the equipment was removed as if it was never there. As a Wireless Integrator, that has deployed thousands of wireless Ethernet bridges, I am a firm believer that wireless technology for broadband backhaul not only provides a phenomenal value but in many cases is a better technology for broadband backhaul than traditional fiber / copper infrastructure. Wireless backhaul, whether we are talking about point to point wireless backhaul, using licensed microwave or an unlicensed wireless Ethernet bridge, point to multipoint wireless Ethernet backhaul (using 5GHz unlicensed wireless band or WiMax), or wireless mesh, can provide greater reliability, last mile presence, quicker deployments, and is far cheaper than hard line infrastructure. You can say, “Well you do wireless backhaul for a living so you are biased.” Let me tell you about a recent trip I took to a third world country and experienced a natural disaster. 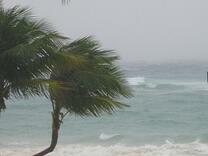 Recently I was on the island of Roatan in Honduras while a hurricane passed over the island. We experience sustained winds of 70+mph (with gusts of 100mph) and about 4 inches of rain. During the storm I was uploading photos to Facebook because I had a fast, uninterrupted full 3G cellular services without any outage or latency. Remember Katrina? Well most of all the fiber networks in New Orleans were wiped out and untill today it hasn't been all fully replaced. Immediately after the hurricain there wireless networks were installed all over to provide voice and data connectivity. All throughout the Caribbean and Central America most countries have leapfrogged the USA in the use of wireless backhaul for telecommunications and broadband services. A lot of countries can’t run fiber due to terrain (jungles, mountains, waterways, and a lack of infrastructure) and the pure inability to afford a fiber build out. Wireless though is everywhere. You can be in the jungles of Belize and have a solid 3G connection. Like I always say, if wireless backhaul is properly engineered and the wireless installation is done properly it is extremely reliable! Wireless backhaul, often referred to as fixed wireless backhaul or wireless Ethernet bridges, has become a standard for creating network connectivity between locations. Wireless backhaul can be used for establishing data network connections from building to building, field locations to a network presence, connecting network fiber segments, or last mile connections, etc. Wireless Ethernet bridges can also be used for connecting devices on to networks, like IP video cameras, SCADA devices, client devices, phones, two-way radio / pagers, etc. Wireless backhaul can be in the form of point to point wireless, point to multipoint wireless, or wireless mesh configurations. Wireless bridges can be licensed microwave links or unlicensed wireless Ethernet bridges. A licensed microwave link or wireless Ethernet bridge can provide throughput as low as 10Mbps up to GigE full duplex (with gigabit wireless). Wireless Ethernet bridges, allow you to eliminate reoccurring costs of leasing fiber from telecommunication companies, eliminate the cost of additional head end equipment, and AES encryption hardware devices. Wireless Ethernet bridges preserve native IP throughout the system. Because you own the microwave link connection and not lease it, ROI is maximized with a low CPEX. 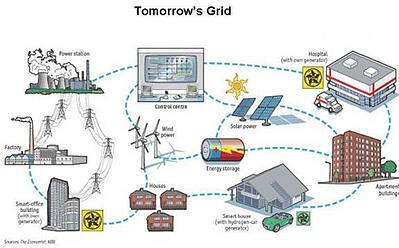 You also gain the peace of mind of having control over your own infrastructure. Take for example the cost to lease a DS3 (45Mbps) connection through a carrier. A typical scenario is that it costs roughly $4000.00 a month with a 3 to 5 year contract. Over three years that’s $144,000.00! Let’s not forget that it also typically takes 3 to 6 months to provision. Now for comparison, let’s look at a point to point wireless Ethernet bridge using a licensed microwave radios. Although you can install a 50Mbps full duplex (100Mbps aggregate throughput) wireless bridge, most systems are typically purchased at 100Mbps full duplex (200Mbps aggregate throughput) because there just isn’t much cost differential between a 50Mbps and 100Mbps full duplex licensed microwave link. It’s typically the same radio system and just software throttled. Most licensed microwave radios are capable of 366Mbps full duplex (732Mbps aggregate throughput) and 60GHz and 80GHz millimeter wave is GigE full duplex. A typical 100Mbps full duplex licensed microwave link, which can be installed in several days rather than 4 to 6 months like a DS3, would have a CAPEX of $20,000.00 to $30,000.00 depending on the frequency and distance. Say you add in a 5 year advanced replacement manufacture warranty and annual support from the integrator at a cost of $15,000.00. That’s roughly $45,000.00 compared to $144,000.00. That gives you an ROI of roughly 11 months. Plus you have over double the bandwidth! As you compare higher bandwidths like leased 100Mbps or gigabit fiber the ROI is increased even further. Most GigE wireless backhauls have an ROI of 3 to 4 months. That’s it. No more reoccurring costs because you own it. If a wireless Ethernet bridge is properly engineered and the wireless installation is done by a professional wireless integrator a point to point wireless backhaul can provide greater security over leased lines and give 99.999% reliability (meaning <5min of predictable outage a year). Most telecommunication companies can only guaranty 99.9% on a SLA because they know they’ll have network outages throughout the year. Wireless backhaul in the form of point to point microwave - licensed microwave links or unlicensed wireless Ethernet bridges, point to multipoint wireless Ethernet bridges, or wireless mesh network infrastructures can provide up to 99.999% reliability and keep you up and running when your telecommunications provider fails you. Do you ever experience downtime on you network due to outages with your telecommunications provider, such as: AT&T, Verizon, or Comcast? What does a network outage cost you organization in dollars and man hours due to lack of productivity and internal communication or with clients? What do you say? This never happens? Think again! You think you’re safe because you have a point to point fiber connection from your telecommunications vendor? Read my article “Outdoor Wireless Bridges or Fiber, Which Do You Trust.” What if you use an MPLS network, doesn’t that provide you failover redundancy? What about having different carriers for a backup connection? Or what about using cellular modems as a last result? Aren’t you protected by having redundancy? Not really! The true fact is that the major telecommunications companies have outages all the time. December 11th, 2009 San Francisco experienced a several hour AT&T outage. July 21, 2010, AT&T Wireless had a regional outage for hours in NC. On April 9th, 2009 Santa Clara County, CA declared a local emergency when someone intentionally cut an underground fiber optic cable in South San Jose taking out cellular, internet, and phone usage to AT&T, Verizon, and Sprint/Nextel customers. This affected multiple cities. A local hospital had to cancel surgeries due to the emergency. Recently, Union City, CA experienced a city wide outage when central office went dark. All voice, internet, MPLS, cellular, etc. was out for almost 10 hours. So what happens when you have no cellular, internet, data, or voice connectivity? For some organizations they have critical operations that have to be monitored so they have to be physically manned if the network goes down. What’s the cost to deploy people to remote sites or work overtime during the middle of the night? What about lost data? Some organizations can run into the millions of dollars an hour during a network outage. Too often organizations fail to ensure their communications, both data and voice, are protected by not having appropriate redundancy or just flat out relying on a third party telecommunications vendor. Many times those who have a redundancy solution in place don’t have “True Redundancy.” Many overlook their WAN connections or have single point of failures in using the same medium (such as fiber), or taking the same external routes (out the same conduits from their MPOE), or have unknown points of failure by relying on third party telco providers’ networks. You can have MPLS but if you first connect through a local central office and that CO goes dark there is an issue. Even with backup power central office have gone dark (recently in Union City, CA) and fiber lines have been cut (San Jose, CA). Wireless backhaul connectivity, both point to point wireless links and point to multipoint wireless bridges, provide an avenue for extremely reliable primary connections and for creating “True Redundant” network paths and connections. With both unlicensed wireless Ethernet bridges or licensed microwave links, an organization can create a completely separate stand alone network and eliminate the dependency on third parties equipment and facilities, and remove the risk of failure of fiber cuts off site and out of an organizations control. 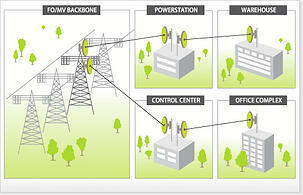 Wireless backhaul can have multiple advantages. Wireless networks can be used for primary or redundant links. Throughput can match or even exceed that of a leased line from a telco. You can get connectivity where you can’t get it from a telco for last mile solutions. Wireless backhaul typically has an extremely low ROI and can eliminate reoccurring lease line costs. Wireless installation can be done in days compared to months of provisioning time from a telco. Also with wireless backhaul you have complete control of your network. Even in the event of equipment failure wireless nodes can be restored quickly by simply hot swapping the radio communications equipment. That’s right no more trouble tickets from some call center agent in another country! Wireless backhaul, also known as fixed wireless, technology has become a standard means of creating a data communications link between locations. 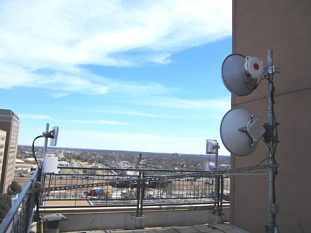 Microwave radio links can be used to make data connections from building to building, to connect remote field locations to a network presence (also known as last mile wireless), connecting network fiber segments, and for connecting network devices (like IP video cameras, SCADA devices, client devices, phones, two-way radio / pagers, etc.) to networks. Wireless backhaul can be in point to point wireless, point to multipoint wireless, or wireless mesh configurations. Wireless bridges can be licensed microwave links or unlicensed wireless Ethernet bridges. A licensed microwave link or unlicensed wireless Ethernet bridge can provide throughput as low as 10Mbps up to GigE full duplex (with gigabit wireless). There are many wireless backhaul radio platforms offering a solution to just about any application. Wireless backhaul systems can provide 99.999% reliability. A Point to point wireless Ethernet bridge or licensed microwave link can enable high capacity wireless backhaul connections from less than one mile to more than 50 miles, without performance degradation. Licensed microwave links and unlicensed wireless Ethernet bridges enable carrier class delivery of IP services with full wire-speed performance. Typical latency on a wireless Ethernet bridge or licensed microwave link is under 1ms. Even though there are some outdoor wireless radio systems that can do non-line-of-sight (“NLOS”), the majority of wireless backhaul requires line-of-sight (“LOS”) with proper Fresnel Zone clearance to properly operate. This means the transmitting and receiving antennas most be able to see one another with any obstructions. 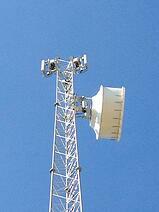 In most cases this requires mounting the antennas on a structure with adequate height to create LOS. Many times when doing a point to point microwave link from one tall buildings roof top to another’s it can be easy to have LOS. Sometimes this is not possible. Putting a antenna mast on a roof top can sometimes be sufficient. Other times it may become necessary to construct a communications tower. The first reactions that come to a client’s mind when a wireless installation vendor says a tower need to be built is no way. Several misconceptions arise. Towers are too expensive, unsightly, and are a huge construction project. Reality is that none of these are true. 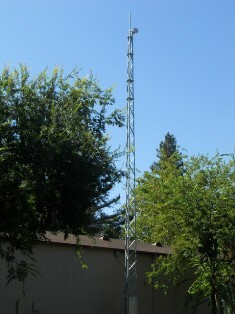 Communication towers are relatively inexpensive to have installed. Leasing high speed bandwidth form a telco or installing dark fiber is extremely expensive. Point to point wireless backhaul or creating point to multipoint wireless Ethernet bridges for last mile connections have a rapid ROI (typically less than 6 months with no reoccurring costs). Adding a tower into the solutions may only add 3 to 4 months until the CAPEX achieves and ROI. 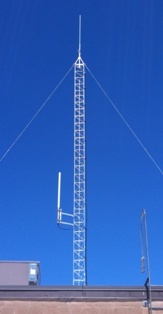 Free standing towers from 40ft to 80ft in height can be installed from $15,000 to $35,000. That is not much money when you look at the big picture. Build it and they will come! Communication towers are typically built for an initial solution but can offer great potential for future wireless backhaul projects. The tower may have been built to accommodate a point to point wireless bridge like a licensed microwave link between two locations. Now in place it may be used for other wireless Ethernet bridges or point to multipoint last mile wireless bridge connections. Odds are that if you needed to build a tower to gain some height in a geographical area other may need some height too. Leasing opportunities can come knocking on the door. Tower can create a great source of re-occurring revenue for an organization by leasing antenna space off to other parties that need a repeater location or leasing space to the mobile carriers, like At&t, Verizon, Sprint, Clearwire, etc. These opportunities can pay for the tower itself. The fact is that there are tower all around us and we just don’t even notice them. Microwave communication towers tend to blend into the skyline. So many times we hear about cosmetic concerns when it comes to mounting antennas on buildings but the fact remains that they are all around and no one ever notices them (unless you are in the wireless industry and pay attention to them). Many are less obtrusive that satellite TV dishes everyone mounts on their homes! Microwave tower have been manufactured in ready to deploy configurations and even come with approved engineered design drawings making the permitting process simple. Communication towers used for wireless backhaul can typically be installed within a few days and offer a long term solid structure for mounting wireless backhaul antennas and equipment.